At a time of his life, Hercules became insane and as a result he killed his children. When his sanity returned,he received instructions from Pythia ,the priestess of the oracle in Delphi,to go to Tiryns and perform any ten labors devised from him by king Eurystheus . As we will later see, the ten labors were increased to twelve, since Eurystheus at some time challenged the fact whether Hercules had truly completed two of the labors assigned to him. By successfully completing these labors, Hercules would not only pay for his crime, but also achieve immortality and take his rightful place among the gods. Reluctantly, Hercules agreed to submit to the will of the hated Eurystheus, to whom Hera had given the throne that Zeus had intended for Hercules. Click here if you want to learn more about the life of Hercules. In the first of the labors of Hercules, Eurystheus commanded the hero to bring him the hide of the Nemean Lion. The lion that had been terrorizing the valley of Nemea, was one of the monstrous children of Echidna and either Orthus or Typhoeus, or had fallen to earth from Selene (Moon). At first, Hercules tried to shoot it with his arrows, but seeing that the lion's pelt could not be pierced, he attacked it with his clubs. The lion ran away and hid in a cave with two entrances. Hercules blocked the one entrance, then wrestled with the lion and strangled it.He then skinned it and wrapped himself in its skin, after first offering a sacrifice to Zeus the Savior.He then returned to Mycanae with the lion thrown over his shoulder. Seeing Hercules dressed in the lion's pelt, Eurystheus was so frightened that he ordered him to leave all his future trophies outside the city's gates. He then had a large, bronze jar forged and buried in the earth. Thereafter, whenever Hercules approached, the cowardly Eurystheus hid in this jar and had a messenger relay his next orders to the hero. Hercules's second task was to kill the Lerna Hydra (water snake), daughter of Typhoeus and Echidna, and sister of Orthus and Cerberus. 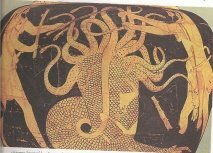 The Hydra, who lived in the marshes of Lerna, devoured people and animals. She was a horrifying monster with huge dog-like body and many serpentine heads (some say as few as seven, others claim 10,000), one of which was immortal. She had foul, poisonous breath that killed anyone who inhaled it. Hercules's aide on this labor was his nephew and charioteer Iolaus, the son of his brother Iphicles and Automedusa. They arrived together at the Amynone Spring, which was the monster's hideaway. Hercules forced the beast out by shooting flaming arrows into the lair. Much to his surprise, Hercules saw that for every head he shot off, two more sprung in its place. A giant crab also helped the Hydra by biting on Hercules's leg. Hercules killed the crab. He then sought Iolaus's help, instructing him to sear each new wound with burning branches. This checked the flow of blood and prevented the growing of new heads. 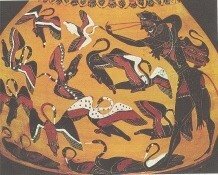 After he killed the Hydra, Hercules dipped his arrows in its poisonous blood. Thereafter, anyone wounded with these arrows would die. He then buried the monster's head in the road between Lerna and Elaeus and placed a rock over it. Although Hercules completed this labor, Eurystheus refused to give him credit for it, because he claimed Hercules had received assistance (from Iolaus) to accomplish the feat. The third of the labors of Hercules was to capture alive the Cerynitian hind, which the nymph Taygette had dedicated to the goddess Artemis and which lived in the Sanctuary of Artemis on mount Cerynea. A wonderful deer with golden antlers and brass hoofs, this hind roamed the hills of Cerynea between Arcadia and Achaea, in central Peloponnesus. Because the hind was sacred, Hercules hoped to capture it unharmed. After pursuing it for almost a year, the hero finally managed to capture the animal on the banks of the river Ladon, after having chased it as far as the land of the Hyperboreans. While returning to Tiryns with the deer on his shoulders, Hercules met Artemis and Apollo. Artemis chastised Hercules, but let him pass with her deer when he insisted that Eurystheus should be blamed for this insult. 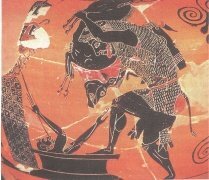 For his fourth labor, Hercules was ordered to capture the boar that lived on the Mount Erymanthus, and was ravaging the land of Psophis (near present day Kalavrita). Hercules first chased the boar out of its hiding place in the forest, pushed it into a snow covered ravine, and then captured it in chains. On his way back to Eurystheus, Hercules clashed with the centaurs who attacked the hero by throwing rocks and tree trunks at him, after going mad from the smell of the wine Hercules had been offered by his friend centaur Pholus. Hercules killed many of his attackers and drove the rest to a new home on Mount Malea, where their king Cheiron lived, who was also an old friend and teacher of Hercules. By accident, however, Cheiron was mortally wounded by one of Hercules's poisonous arrows. His pain was so intense, that Cheiron, being immortal, resigned his immortality to Prometheus. Perhaps to humiliate him, Eurystheus assigned Hercules as his sixth labor, to clean the stables of Augeias, king of Elis (located on the western coast of Peloponnesus) and a son of the sun god Helius. Augeias, who had taken part in the expedition of the Argonauts, had countless herds. When Hercules asked for one-tenth of the king's animals as his fee for cleaning the stables, the king agreed because he was convinced that the task was impossible. But Hercules, proved to be more clever than the king had imagined: He tore down a wall and diverted the waters of the rivers Alpheius and Peneius into the stables. The stables were cleaned in a matter of hours, but Augeias refused to keep his promise, insisting that Hercules had a duty to perform this labor for Eurystheus. To make matters worse, Eurystheus refused to give him credit for accomplishing the labor, contending that he had done it as a job for hire. As some other storytellers insist, Eurystheus withheld credit and Augeias refused payment, because they contended that the river gods Alpheius and Peneius, rather than Hercules himself, accomplished the feat. The fifth of the labors of Hercules was to rid Lake Stymphalus in Arcadia of its vast flocks of man-eating birds. These Stymphalian birds had claws, beaks and wings of bronze and they were fed on both humans and beasts. With the assistance of Athena, who lent him a pair of bronze castanets forged by Hephaestus, Hercules drove the birds far away from Arcadia: The noise of the clattering castanets frightened the birds, who flew as one into the air. Hercules shot with his arrows a great many of them, while the others quickly fled the scene. They were said to find shelter in a faraway island which belonged to Ares, the god of war. There, they were later to be encountered by Jason and the Argonauts. The eighth of the labors of Hercules sent him to Crete to capture the Cretan bull,which was said to be the father of the Minotaur by Pasiphae, wife of the Cretan king Minos. By one account, the Cretan bull was the beast that had carried Europa from Phoenicia to Crete for Zeus. In other myths, the bull was sent by Poseidon to Minos,to be sacrificed following the king's promise that he would sacrifice to the god anything that rose from the sea. But Minos, struck by the animal's beauty, sacrificed in its place another bull, thus provoking the god's rage. The sea god then in revenge drove the animal wild, ravaging the crops and orchards of Crete. Hercules captured the beast after a lengthy struggle. He brought it all the way back across the sea to Tiryns, to present it to Eurystheus. He then set the beast free. It then roamed around Laconia and Arcadia, crossed the Corinth Isthmus and ended up in Marathon, to be later captured and killed by Theseus. Eurystheus next sent Hercules to Thrace, to capture the four man-eating mares of king Diomedes. The son of Ares, god of war, Diomedes fed his savage mares on the flesh of his innocent guests. On his way to Thrace, Hercules enjoyed the hospitality of Admetus, king of Thessaly in northeastern Greece. Admetus was cursed by one of the gods to die at a young age. He could only be saved, if one of his parents or his wife, accepted to take his position. When he was seriously ill, his beautiful wife, Alcestis, offered herself to take his place. When Hercules reached their palace, Alcestis was dying. Touched by her sacrifice, Hercules decided to rescue her. He entered her room and when he saw Thanatos (Death) by her bed side, he wrestled with him and beat him. After rescuing Alcestis, Hercules continued on to Thrace. There, he stole the king's horses and drove them to the sea. When Diomedes and his subjects pursued him, Hercules managed to kill the subjects, wrestle with Diomedes and feed him to his own mares. Hercules then harnessed the untamed mares to Diomedes's chariot and drove them all the way back to Tiryns. 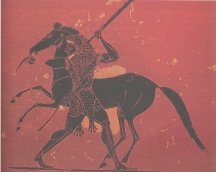 Eurystheus released the horses into the wild. They finally ascended into the Mount Olympus, where they became the prey of wild animals. According to another version of the myth, the mares were in reality the extremely ugly daughters of Diomedes, who forced strangers to lay with them and then he killed them. Admete, the daughter of Eurystheus, asked her father to have Hercules bring her the exquisite belt of Hippolyte, queen of the Amazons. The belt was a gift of Ares, the god of war. The hero thus was off to the land of the Amazons, the famous tribe of female warriors who lived near the Thermodon river, which flowed through northeastern Asia Minor and emptied into the Black Sea. The Amazon were daughters of Ares and the Naiad Harmonia. They spent two months of the year with the Gargareis of Ida in order to perpetuate their tribe. Some say that to keep their men devoted to household chores, the Amazons broke the arms and legs of male infants, making them unsuitable for war. 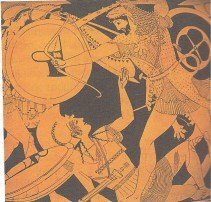 Others say that Amazons killed all male infants. Their left breast was either uncovered, or cut off, so as not to obstruct the use of the bow, or hurling of a spear. Hippolyte, after meeting with Hercules, at first agreed to offer her belt to him. But Hera, who continued to track the hero, changed into an Amazon and spread the rumor among the Amazons that Hercules wanted to abduct their queen. The Amazons thus rushed to attack their enemy. In the battle that followed, Hercules killed Hippolyte and obtained the belt. 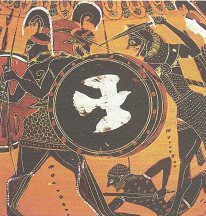 He and his companions then defeated the Amazons and returned to Tiryns with the prize. For his next labor, Eurystheus sent Hercules to a faraway place in present-day Spain, with the order to fetch the cattle of Geryon. Geryon was a monstrous giant with three upper bodies and was the son of Chrysaor and the oceanid Calliroe . He owned a herd of beautiful red cattle, kept under the watchful eye of Eurytion , a son of god Ares , and the two-headed dog Orthus , another monstrous child of Typhon and Echidna . When Hercules reached the Strait of Gibraltar , he erected pillars on both sides (one in Europe, one in Africa) to mark the great distance he had traveled. Those pillars, still standing today, are called the Rock of Gibraltar (or Mount Calpe ) and Morocco's Jebel Musa (or Mount Abyla ). Although both Orthus and Eurytion attacked him as he approached the cattle, Hercules killed both of them with a single blow of his mighty club. As he drove the cattle towards his ship - which by the way was an enormous golden cup lent to him by the sun god Helius - Geryon tried to stop him. Hercules, however, managed to kill him by shooting a single of his poisonous arrows through all his three bodies. After leaving Spain, Hercules had a long and hard journey back to Tiryns. In Liguria (near present-day Marseilles in France), Hercules managed to kill two thieves who tried to steal the cattle. In retaliation, the Ligurians attacked him with such a numerous army, that Hercules ran out of arrows and was wounded. 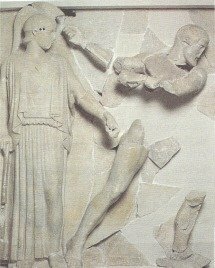 But, his immortal father Zeus helped him by sending a shower of stones against the attackers, thus allowing Hercules to force them to retreat. Continuing his trip back home, Hercules arrived at the site that was to become later Rome . While Hercules was sleeping, a three-headed giant named Cacus - a son of Hephaestus and Medusa - stole some of Geryon's cattle. Not intimidated by the flames spewing from the giant's mouth, Hercules managed the next morning to enter the monster's cave and kill him with his bare hands. Hercules thanked the gods for his victory, by sacrificing some of his cattle on an altar that the Romans would later call the Ara Maxima ("Greatest Altar"). In Roman times, this Altar stood in the middle of the great city. Hercules's misfortunes had no end: When he reached the straits of Messene , Geryon's finest bull escaped from the rest of the herd and swam from Italy to Sicily . Hercules pursued the animal and finally found it mingled among the herds of Eryx, a powerful boxer and wrestler, who was the son of sea god Poseidon and the goddess Aphrodite . Annoyed by Hercules, Eryx challenged the hero to a wrestling match, betting his island kingdom against the herd of cattle. Mightly Hercules killed his opponent by smashing him to the ground. Eventually, the greek hero landed at Ambracia where he gathered the Geryon's cattle, actually what remained of it, and guided it to the Hellespont . Arriving at Scythia , he was united with the monster Echidna, with whom he had three sons: Agathyrsus , Gelonus and Scythes , from whom the Scythians descended. 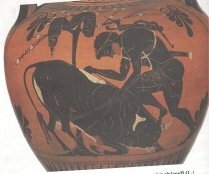 From an entire herd of cattle, Hercules managed to bring Eurystheus only one ox, which the Mycenaean king sacrificed to Hera. With the turning over of the cattle to Eurystheus, the labors of Hercules completed amounted to ten, equal to the number of labors originally postulated by the oracle of Delphi . But, since he was denied credit for the second (The Lerna Hydra) and fifth labors (Augeian stables), Hercules had to perfom two more labors. For his eleventh labor, Eurystheus sent Hercules to the westernmost part of the then known world, to the Garden of Hesperides. 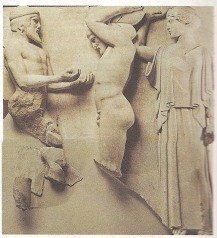 There, he was mandated to obtain three Golden Apples from the tree that Gaia had given her granddaughter Hera , on her wedding day with Zeus . The golden-fruited tree was tended by nymphs known as Hesperides and guarded by a vicious hundred headed dragon named Ladon , the mostrous child of Typhon and Echidna . Over the garden towered the titan Atlas , who bore the heavy burden of holding up the sky. First of all, Hercules had to find the location of the Garden. When he arrived at the Eridanus river , the nymphs there instructed him to ask the sea god Nereus , who was an oracle. Since the god was reluctant to reveal the information to Hercules, the hero tied him up until he succumbed. Apart from giving Hercules directions to find the Garden, he also advised him to talk Atlas into obtaining the fruit for him. So, when Hercules finally reached the Garden, he offered Atlas to relieve him of his huge burden in return for the small favor of bringing him the apples. After Hercules shot and killed Ladon, Atlas was convinced to take up on the hero's offer. However, when Atlas returned with the apples, he seemed unwilling to relieve Hercules of his position of holding the sky. Instead, he offered to take the apples to Eurystheus himslef. Being shrewd not only strong, Hercules complained that his shoulder ached from the huge load and pleaded Atlas to take his position for a little while, until he could put a cushion over his head to mitigate the load. The gullible titan agreed. As soon as Hercules was relieved from holding the heavens, he walked off with the precious apples. On his way back home, Hercules again had to endure a lot of adventures. In Libya, he met a giant named Antaeus , son of Gaia and Poseidon , who liked to wrestle his guests to exhaustion and then kill them. As they fought, Hercules realized that the giant's strength and vigor were renewed each time he fell to the ground, thanks to his mother Earth. The hero then, held the giant high up in the air and crushed him to death in his arms. Arriving to the Caucasus mountains, Hercules met with the titan Prometheus , who had been chained to a cliff for 30,000 years. Taking pity on him, Hercules shot and killed the eagle who had been feasting with the titan's liver every day all these years. He then arranged for the wounded centaur Cheiron (as we saw in the fourth of the labors of Hercules above) who begged to be freed from the pain caused by Hercules's poisonous arrow, to take Prometheus's place in the underworld, and then freed the titan from his chains. When Hercules finally presented the Golden Apples to Eurystheus, the king immediately handed the fruit back to him, since the sacred fruit belonged to Hera and thus they could not remain out of the Garden. Hercules turned them over to Athena , who returned them to their original place in the Garden. The last of the twelve labors of Hercules, was the most dangerous and horrifying of all: Hercules was ordered from Eurystheus to bring from the Underworld Cerberus , the hideous three-headed guard dog of Hades , son of Typhon and Echidna . Before setting off to complete his task, the hero was initiated into the Eleusinian mysteries . Accompanied by Athena and Hermes , he descended into the dark kingdom of the souls through a crevice known as Taenarum . After freeing Theseus and killing Hades's herdsman Menoetes in a wrestling match, Hercules presented himself before the ruler of the Underworld and explained his mission. Hades allowed Hercules to take Cerberus with him, provided that he would capture him with his bare hands and that he would return him back, after showing him to Eurystheus. Hercules remained true to his promise. After a fierce fight, he managed to capture the monstrous dog and, accompanied by Hermes, he ascended to earth from a gap near Troezen. Then, after presenting Cerberus to Eurystheus in order to receive due credit, he returned him to Hades.